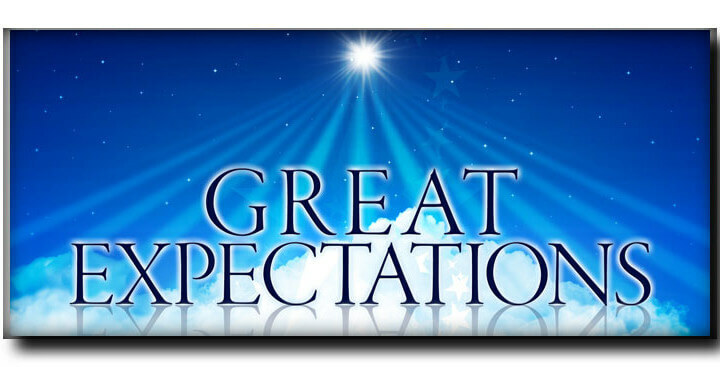 Great Expectations is not just the title of a book – it is a way of Life. When asked “How ya doing?” any response less than “great; fantastic or; wonderful” falls terribly short of the mark. We are perfect spirit beings experiencing the most advanced bio machinery ever developed with untold and untapped abilities that we get to explore during this plane of existence. Viewed from that perspective, even our “not so great days” are pretty amazing. Although I’ve covered this in prior forums, it requires additional study. As mentioned before, the text implies a continued and constant, consistent “asking, seeking and knocking”. What I did not bring to the surface prior to now is that it also implies, almost as if it were a requirement, is the expectation of success. It makes sense on multiple levels: if you did not truly expect to get what you want or need, you would not be able to ask/seek/knock with any type of prolonged effort. Once we align our animal host shells with our perfect spirit selves, we will know that which is good and expedient; then, the desires of our spirit will become the desires of our hearts, and “asking, seeking, knocking” will turn into a cycle of receiving, finding and, in general, winning! Many of us, myself especially, have very few needs that are not met – and a long list of wants that grows by the moment. In that sense, we are spoiled children having temper tantrums – and as cute as children are, temper tantrums grow old, quickly at that! Aligning our animal host shells with the spirit puts these things into perspective, and allows us to move forward with a spirit of gratitude. When we are appreciative, thankful even, it is easier to receive even more. As strange as it may sound, think to your own experiences: we prefer to give to those who are genuinely appreciative. It makes sense, further, to give to those who are not only truly appreciative, but to those who expect to receive “goodness” in whatever form it may manifest. Set the parameters: allow room for creative and amazing features and additions. We may be asking for a specific “thing”, not realizing that something more appropriate and as such, better for us on the individual level, will help us along our journey. Engage in word power: align our thoughts and words so that we resonate with the two most important attributes; great expectations and an attitude of gratitude. Wait, watch, and be amazed.